Another inspiring, eleoquent post my dear. You're right, you shouldn't be judged by the past, but sometimes ignoring one's past opens you up to be used. I guess it's a balancing act. I love this post! And I'm so proud of you. Look how much you've changed? You are so right--the past is just the past and we shouldn't be judged on it. Launna, this is such a great post, and I, too, like menopausal mama, and so proud of you! We all need to look at ourselves and make any necessary changes, as have yourself. Too many people live in the past! Living in the present is so important for a happy life. You have left your past behind. You are taking care of the Launna of today and doing a fantastic job of it. You are going to be taking on a lot but I know you can do it. Your daughter is going to have a strong woman to look up to. Great targets dear!! I'd like to have time to study, but with my job is impossible! You "muse" me Launna!!!!! Another great post, so inspiring!!!! Totally agree: we shouldn't be judged by the past....changes are always necessary!!! Great that you are going forward. I hope the weather cooperates and all the rest too. You are very inspiring! Yay to your college classes! New beginnings are always so exciting. Your journey has begun. You'll meet new people and form lasting friendships. Think of it as an adventure. Walking is a great exercise for toning the muscle, I love to walk in the evenings. You are right, one should not be judge by the past. I can only repeat this again and again... you are so awesome for what you have done already. I can only hope, that the coming months will be as smooth & easy as possible for you. I mean in every way not just school, but as a mum & in the health and sports part of your life. I believe that the past is just that--the past! We can change ourselves, and no one should be judged. Também vou ter mudanças nos próximos meses. Em outubro concluo minha faculdade de jornalismo. Não vejo a hora! Mas é isso aí, Launna. Se correr está te fazendo bem, faça isso mais vezes. Aliás, só faça o que te faz verdadeiramente feliz! Wow. That was a very inspiring post. I admire people who are always changing and looking to do better. It is not easy but looks like you are on the right path. I agree with you. We have to judge a person by the hear and now. So wise and inspiring! You are very strong and you came such a long way. I'm sure there are a lot of happy and positive things waiting for you just around the corner. The quote is very inspiring to! Keep up the good work, Launna! You have made so much progress over the past few months! I love the quote from the Lion King that says, "The past can hurt, but you can either run from it or learn from it." Am encouranged by your confidence dear.You are able to take charge of your life and let no one control you. Hi Launna:). what an amazing goal of six months that you've had plan. You will do it just fine even two courses in three months, I had an accounting classes before i know wasnt easy for me when i was in a university. I'm a major management wish I could of went to the designer degree but my mom wanted me to take the business one. you can tells, i was an obey child and i always am for my parents:). While me walking with my boys yesterday and saw your commented popped up on my phone:). and since then I just got the chance to login my computer:). I know how you feels about our motherhood is so hard to do something else but unfortunately, we've been trying so hard to get everything done on time:). keep walking with me, I do every morning then yoga! so far so good! wishing a lovely alone time without Valentina:). oxoxo. Hello Launna! How are you doing today? I love the part you say about the past having no control over us once we realise it! Your posts always has a lot of inspiring quotes and it is so refreshing! Love that last line -- the past is just the past. Keep moving forward! Enjoyed reading your post about the changes in you! Past should be just a lesson for us for future. I hope my first commented gone through Launna :). Just incase I'm writing you a new one:). I just finished up my daily exercise:). I think so too, you probably fine the yoga online! I had the yoga classes for several years right before I got pregnant of my twins - so it has been great benefit for me to do it myself at home when I had no time to drive myself to join the class:). hope that the weather is gorgeous for you to go for walk later on the day :). Wishing you an incredible day lovely Launna! I absolutely agree with you. Past should only be useful to learn not to judge oneself/others. Exactly..people should not be judged by their past. Everybody has a past..good or bad but the victory lies in the fact that you have the power to change your present. And I am happy for you that you showed this courage to totally overcome your past and working for your health and fitness!! 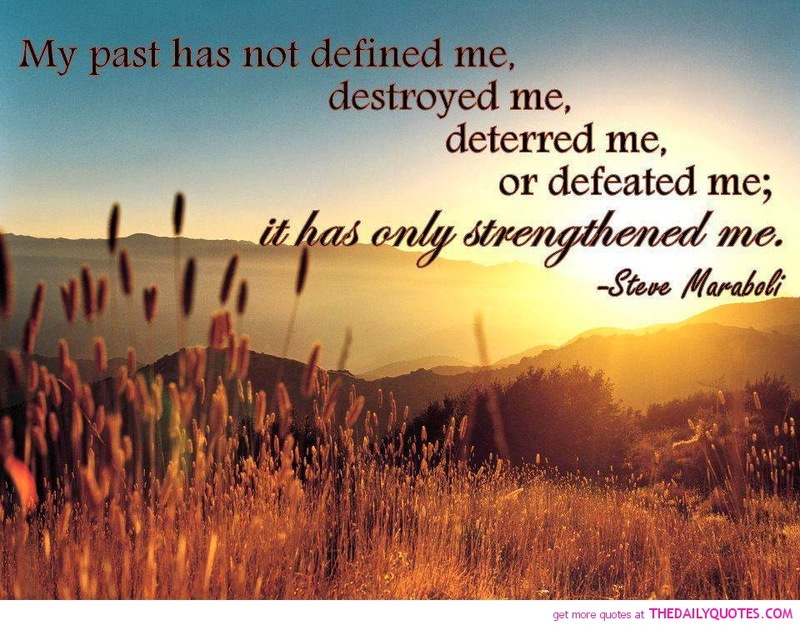 The past made us the person that we are today. And people shouldn't be judgmental I mean everybody has their share of painful past right? That's good to know about your classes!! 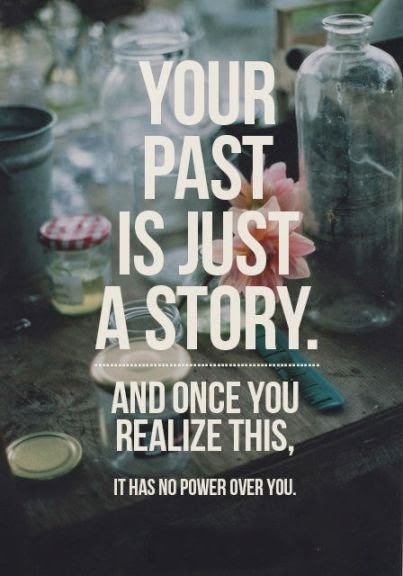 And I completely agree with you, make your past your strength and let it be a story. But you know Launna sometimes its nearly impossible to forget your past and that time its really tough to find something or someone which really motivates you. There are time when I am full of positive things and thoughts but sometime I find it tough to cope with my past! Probably my favourite quote in the entire world is- I made a lot of mistakes in my past but I refuse to live there now. Unfortunately I am terrible at moving on. All day every day I'm thinking of another time not actually living now. If it was easy for me to move on, I would have years ago. Me encanto, el pasado es solo el pasado. 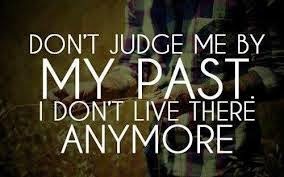 The first sentence is applicable to almost everyone: Don't judge me by my past, I don't live there anymore. Good sentence. Launa you are an inspiration to me, love, as a woman and as a mother. You are soooo dear to me :). And yes the past means nothing to me either, aside fromt he lessons I've learned. 'I am not my past and I shouldn't be judged on it.' i love this passage. it is so true. keep up the good work. one day you'll be fully arrived at yourself and it will feel wonderful! i guess that decorating is a very important factor for feeling at home. you should also start this. believe me, it will make a difference. thank you for your comment to my television cooperation. this was an unbelievably great experience for me and i guess that i'm on the right way ... it's always great to see that someone appreciates your work. Great post here, beautiful. Very motivational!! We can't do anything about the past, but we can change the present/future by adjusting things. Awesome for doing what makes you happy. Keep striving on.